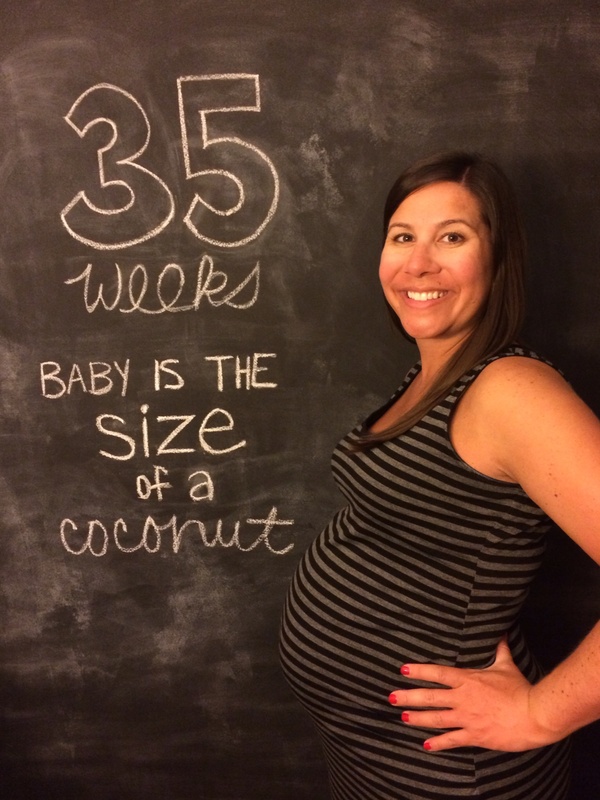 How far along: 35 weeks and the size of a coconut – over 18 inches long and about 5 1/4 pounds. Sleep: Ugh! Sleep is continuing to be a struggle since it is nearly impossible to get comfortable. I guess my body is preparing me for future middle-of-the-night feedings! Best moment this week: Can we talk about that UGA/Clemson game?! I was starting to second guess whether making the trek to Athens at 35 weeks pregnant and nearly 100 degree temperatures was really the smartest move, but every doubt that I had vanished as we drove toward North Campus. I am SO glad that I decided to go. There is absolutely nothing like the opening weekend of college football, being back at my old stomping grounds, tailgating with great friends, and cheering our DAWGS on to an unbelievable victory! It was such an amazing day and totally worth my swollen and sore feet! 😉 We then drove to Auburn the next morning to surprise my mom for an early birthday celebration – we had a wonderful couple days there, too, thanks to a long Labor Day weekend! The boys played golf while the girls soaked up some sun at the pool and lake. It was such a wonderful weekend, and we were sad for it to end! Miss anything: I really wish that I could partake in a delicious pumpkin beer now that it is September and the seasonal beers are hitting shelves! I guess a pumpkin spice latte will have to do the trick for the next month or so. Movement/Symptoms: Molly was kicking up a storm during that UGA game – made Mama proud! She is still moving around a good bit and pressing body parts into my ribs and organs which can be painful at times as she continues to get bigger. The heartburn is still getting worse, too, so I always have a bottle of Tums on hand these days. Cravings: Ice cream, chocolate, jalepenos.